the dividend is evenly divisible by the number consisting of only 9 (Divisor). the number of digits of the divisor (9’s) is half or more than the number of digits of the dividend i.e. dividing a 4-digits number by 99 or 999, a 6-digits number by 999 or 9999 or 99999, an 8-digits number by four 9’s or more ... and so on. Starting from the right-digit omit as many digits(s) of the dividend as there are in the divisor (number made up of 9’s) and then add 1 to the rest part of the dividend. That’s all. However, in case a dividend is also made up of 9 only; then add 2. Let’s say you want to divide 8217 by 99. Notice that, 8217 is a 4-digits number which is to be divided by a 2-digit number 99. So, omit 2 digits from the right of dividend which are 7 and 1 and the rest of dividend is 82. Now add 1 to 82 to get (82 + 1 =) 83. So, our answer is 83. Here the divisor (999) is 3-digit number and the dividend (586413) is a 6-digit number. And the dividend is evenly divisible by the Divisor. So, the rule is applicable. Now, since 999 has three digits; mentally omit three digits from the right side of the dividend i.e.413. Rest of the dividend is 586. Now, add 1 to 586 to get the final answer 587. As there is five 9’s divisor; omit 5 digits of the dividend from the right to get 78464. Now, add 1 to 78464 to get the answer 78465. Here the divisor (9999) is 4-digit number and the dividend (889911) is a 6-digit number. And the dividend is evenly divisible by the Divisor. So, the rule is applicable. 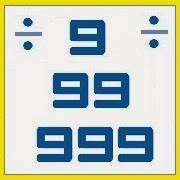 Since 9999 has 4 digits; omit 4 digits from the dividend to get 88 and adding up 1 to 88 gives 89. So, 889911 ÷ 9999 =89.